NIGHTWATCH® isn’t the brainchild of boardroom executives. NIGHTWATCH® is a labor of love. In 2013 Jeffrey Schab (Founder & CEO of Protequus®) and Wade Giles lost their beloved horse, Snoop, to a rare colic event overnight. 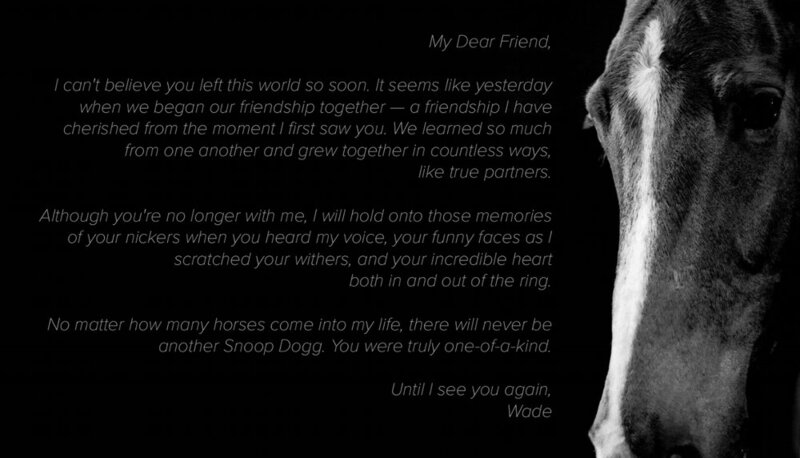 Snoop lived just a short 8 years and died alone in his stall. Following Snoop’s death, Jeffrey was driven to make a difference, and assembled a team of passionate science and technology professionals to find a solution that could combat the devastating impact of equine colic. Today, that solution is an early warning system known as NIGHTWATCH®. As an accomplished equestrian and biomedical engineer with 15+ years of experience in human health, Jeffrey is pioneering a path that bridges his professional expertise with his personal passion. It’s with great pride and respect for our four-legged friends that he leads the NIGHTWATCH® program. Snoop remains a powerful inspiration and motivation for Jeffrey and Wade. It is in his memory that NIGHTWATCH® exists to provide critical first alerts for early intervention, ultimately to help save horses' lives. "It's not about the destination...it's about the journey." On August 25, 2013, Jeffrey Schab and Wade Giles' beloved horse, Snoop, passes away from an epiploic foramen entrapment, a rare form of colic. Driven to not let Snoop's passing be without reason, Jeffrey embarks on what becomes a 5-year journey to invent an early warning system for equine colic and other forms of distress. After 2.5 months of primary and secondary research, Jeffrey establishes Protequus LLC as a legal entity to make his vision for an equine distress & wellness monitor a reality. Protequus (pronounced as pro-tech-kwis) is formed from the word "protection" and the Latin word for horse, "equus." Protequus files the first in a series of provisional and utility patents with the US Patent & Trademark Office (USPTO) and the World Intellectual Property Organization (WIPO) under the Patent Cooperation Treaty (PCT) on February 24, 2014 for a SYSTEM AND METHOD FOR MOBILE ANIMAL SURVEILLANCE AND DISTRESS MONITORING. Protequus enters into a research agreement with Rochester Institute of Technology (Rochester, NY) for classification and modeling of distress in horses using sensor data. Protequus engineers place a first-generation mobile adaptive sensor system (alpha-prototype) on horses in NY and LA to acquire real-time behavior data using a 9-axis IMU and successfully demonstrate proof-of-principal for novel event detection. The NIGHTWATCH® brand is established, complete with a brand persona, brand guidelines, brand lexicon, logo, and certificate of registration filings. After much deliberation, Protequus makes first public disclosure of their R&D efforts and introduces NIGHTWATCH®, the world's first smart halter™. Public support is immediately overwhelming among equestrian and technology communities in the US and abroad. Protequus engineers place a second-generation mobile adaptive sensor system (beta-prototype) on horses in NY and KY to acquire biometric data using non-invasive ultra-wideband impulse radar (UWB-IR) technology and successfully demonstrate a real-world application of UWB-IR for biometric monitoring in horses. The USPTO approves and issues a utility patent (No. 9,629,340) for MOBILE ANIMAL SURVEILLANCE AND DISTRESS MONITORING, which is just a short ~3 years from first filing. This patent confirms the novel, useful, and non-obvious nature of NIGHTWATCH®. Protequus enhances back-end architecture and front-end UI/UX, and completes submission of a third-generation mobile adaptive sensor system (production-intent prototype) to the Federal Communications Commission (FCC), Industry Canada (IC), and PTCRB/CTIA-The Wireless Association for regulatory review and testing. NIGHTWATCH® is determined to be safe and complies with the limits for a Class B digital device, pursuant to Part 15 of FCC rules, and further complies with IC license-exempt RSS standards, PTCRB/CTIA certifcation standards, and International Electrotechnical Commission (IEC) 60950 product safety standards. The USPTO approves and issues a second utility patent (No. 9,894,885) as a continuation of patent (No. 9,629,340) for detecting one or more biometric parameters in animals using UWB-IR. NIGHTWATCH® becomes available to a select number of customers to begin rigorous real-world beta testing. The USPTO approves and issues a third utility patent (No. 10,154,655) as a continuation in part of patent (No. 9,629,340) to predict the onset of parturition in animals using UWB-IR. Protequus® is dedicated to the ideation, creation, and commercialization of value-add solutions for the protection of horses. Our journey has just begun with NIGHTWATCH®. Follow us as we make this revolutionary device available to horses across the globe and introduce new solutions for other ailments afflicting our equine companions.